Study notes for Word Analysis of Quran Lesson 3, Surah Baqarah Ayats 6-7. I hope you find them beneficial to your studies. 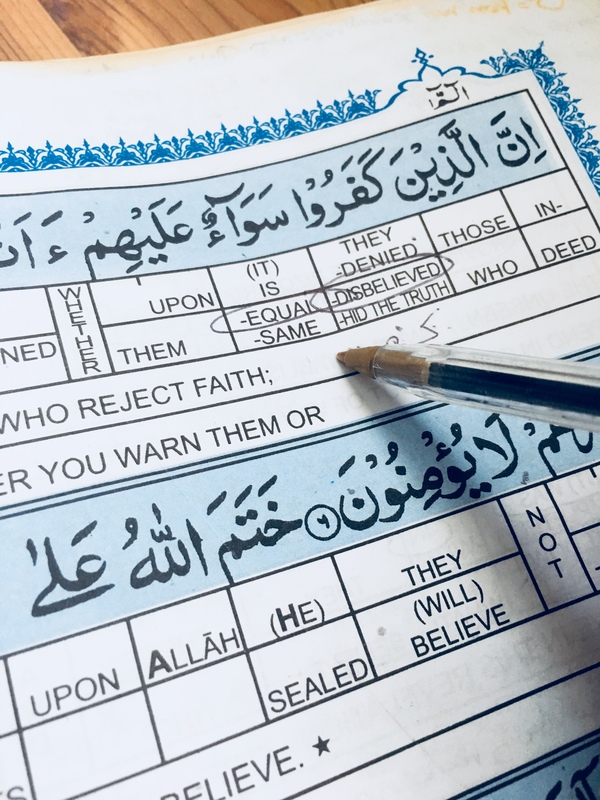 These Verses 6-7 reveals – Warning is of no use for those who reject faith. 6. Indeed, those who disbelieve – it is all the same for them whether you warn them or do not warn them – they will not believe. إِنَّ – Inna, used for emphasis. Indeed this is a fact, this is a reality. ٱلَّذِينَ – Allatheena, those who. Those people who have this particular characteristic. Kafir – in Arabic is used for the night because the night covers everything with its darkness. It is also used for ‘a farmer’ because the farmer covers the seeds with soil. So, to conceal. Kufur is to disbelieve in that which one must believe in. Believing in Allah is necessary. 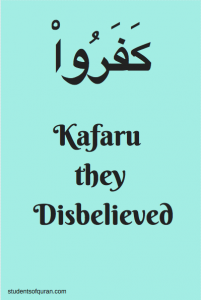 Kafir covers the truth – covers up by denying and promotes falsehood. Also covers the fitrah/nature Allah created us with a natural desire to believe. Kufur includes denial of Islam, ie atheism, other religions etc. سَوَآءٌ – sawaaun, that which is equal from both sides, it is the same, it does not make any difference. عَلَيۡهِمۡ – alayhim, It is the same upon them. This refers to the disbelievers. It makes no difference to them. To warn somebody emphasising a level of fear. There are many different ways to warn someone. ءَأَنذَرۡتَهُمۡ is a warning done out of love, care and concern. It should be done in time, meaning, there is enough time for the person to prepare before any harmful thing happens. is used in the past tense. 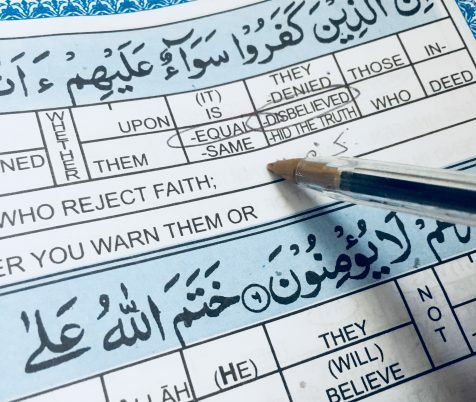 It does not make a difference whether you warn them in the past, present, or warn them in the future, Allah says it is the same upon them, they will not believe. They will not believe. They will totally ignore the warning. There is emphasis put on all the tenses past, present and future, but it will not make a difference, they will not take the warning. The reason is given in the next verse. Their ears become deaf, their eyes are blinded to the merits of their own doctrine so the truth cannot be seen or heard. Khatamun Nabiyyeen the Seal of the Prophets. The last Prophet to have brought a complete and comprehensive universal law for humanity Prophet Muhammad (pbuh). No other Prophet is going to be sent by Allah. أَبۡصَـٰرِهِمۡ – Absaurihim plural of the word “basar” is used for eyes, the faculty of seeing, sight. Ghishawa is generally a covering through which a little can still be seen. So there is still some hope for the disbelievers. Although they can’t hear and their hearts are sealed, Allah is merciful and has given them a translucent opening so they may recognise the truth. وَلَهُمۡ – and for them – referring to those who are stubborn in their disbelief. A person is so thirsty that he is unable to sleep or eat. So thirsty that they cannot enjoy other pleasures. Imprisonment and prevention – to be confined in one place. To take the sweetness away from something – a state in which there is torture, confinement. So there is something in ‘adhaab that prevents one from living and enjoying life. All the pleasures of life are taken away indicating extreme agony. ‘adheem is describing the punishment. Their punishment is عَظِيمٌ۬ (great) because of their persistence and stubbornness in their disbelief.